The only serious competitor to Emily Post as etiquette maven to America between the wars, LILLIAN EICHLER WATSON (b. 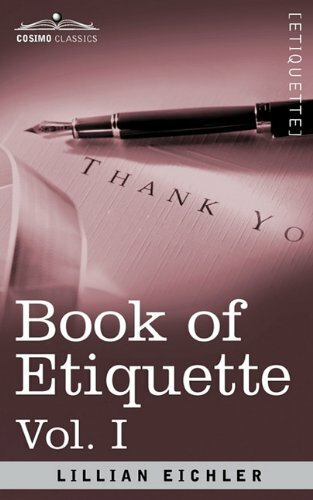 1902) was a 19-year-old copywriter for the book publisher Doubleday when she was commissioned to rewrite the outdated Encyclopedia of Etiquette by Emily Holt. This is the guide to good manners she produced in 1921, mining her own experience as a social misfit and would-be social climber, and it was a huge hit with those aspiring to a grander station. Volume I covers: â¢ why it pays to be agreeable â¢ the secret of social success â¢ engagements and weddings â¢ how and when to make an introduction â¢ the intricacies of the social call â¢ calling cards for the young lady, the married couple, and others â¢ correspondence and invitations â¢ appropriate dress for children â¢ addressing titled people â¢ and much more.